As he declared victory in the early hours of November 7, Mayor-elect Michael Bloomberg listed housing among the short list of big problems facing New York City today, and suggested that his plan for the city's future envisioned more affordable housing. But what exactly does Bloomberg mean by affordable housing? What policies can we expect from him? And how will recent events affect our city's long-standing housing crisis? Housing was one of the most important issues in the campaign for mayor before September 11. While most New Yorkers were generally satisfied with the state of their city, many objected to the high cost and low availability of housing. A New York Times poll found that 60 percent of respondents considered housing a "serious" problem, ranking second only to education as an issue of concern for voters. Many New Yorkers realized that improvements in the economy (and in the image) of the city had made an already tight housing market even worse. Increased demand had driven up prices at the upper end of the housing market, and gentrification displaced lower-income residents throughout the city. The absence of affordable housing drove up the city's homeless population to record levels. During the past summer more than 29,000 New Yorkers spent their nights in the city shelter system, including some 12,000 children. Housing issues were particularly central in the battle between Mark Green and his closest rival at the time for the Democratic nomination for mayor, Fernando Ferrer. Ferrer's surging campaign hammered on affordable housing as one of the major needs of the "other New York." In response, Green - who as the front-runner had made few specific commitments on housing - staged a September 1 press conference in Harlem to commit $1.2 billion in new city funds to produce and preserve 150,000 affordable apartments over the next decade. The next administration at City Hall was thus expected to make the production of affordable housing one of its first priorities. Most candidates even identified a particularly promising way of funding their plan - the many millions of new tax dollars that would come from the leasing to a private company of the Twin Towers of the World Trade Center. In the immediate aftermath of the terrorist attack on the World Trade Center, the politics of the previous summer seemed irrelevant. As the city banded together, housing groups focused on providing what emergency assistance they could, such as offering temporary housing to the thousands of displaced residents in lower Manhattan and to relief workers who had come from across the nation to help out. As the initial shock has diminished, some New Yorkers are starting to ask how this catastrophe will affect a housing crisis that has existed for decades. One effect was immediately evident. Without expected World Trade Center and Battery Park City revenues, "a potential source of revenue to deal with the affordable housing problem has been wiped out," notes Brad Lander of the Fifth Avenue Committee, a Brooklyn-based neighborhood development corporation. "This is by no means the most tragic consequence of that loss, but it is a consequence that we need to deal with nonetheless." As for the long-term effects, it is difficult to predict how the overall housing market will change. Much will depend on the job market, and the success of efforts to rebuild the city's confidence and infrastructure. Analysts predict that the city's housing crisis will generally get worse. But they don't know how much money will be available to address the problem. Nobody pretends to know exactly what our future economy is going to look like. As Frank Braconi of the Citizens Housing and Planning Council puts it, the city's economic and budget forecasts remain "really fluid" right now. "The situation is still evolving. People don't really know how severe tourist and other industry slumps will be. Any budget projections are very preliminary." Housing economists are waiting to see how a number of new budget variables will play out in the coming months. On the one hand, the city budget will be strained by declining tax revenues and new costs associated with recovery and rebuilding. On the other hand, the economy will be boosted by the influx of billions in relief funding arriving from insurance companies and federal aid. Some observers also worry that the cost of housing construction could rise in the coming months and years. Michael Schill, director of the Center For Real Estate and Urban Policy at New York University Law School, suggests that competition for labor with the massive clean-up and rebuilding effort could drive up labor costs for housing construction, while the need to replace lost office space immediately could drive up the cost of land. But the changes will not necessarily be bad for everybody. The rebuilding effort in lower Manhattan and elsewhere could speed up the review process by which projects are approved. New York City is generally unified in its desire to rebuild the millions of square feet of office space destroyed in this disaster as quickly as possible. That likely means that government, planners and builders will find ways to cut through existing zoning and environmental regulations where needed. Streamlined construction in the business sector could prove to be a valuable model for streamlining housing construction in the city as well, Schill suggests. And efforts to reduce the cost of housing construction - already a priority for advocates before September 11 - are more necessary than ever. At the same time, the rebuilding effort will face unparalleled public scrutiny. Any moves perceived to undermine public review, health or safety will likely face stiff opposition. Some observers also have suggested that expensive apartments might actually become a little cheaper. This will happen if the demand among upper-income New Yorkers begins to shrink. If anybody flees New York in the wake of new insecurities, it will be primarily those with the resources to do so. If local jobs leave for the suburbs, some city residents could follow them as well. And if upper-income New Yorkers start to fear a volatile stock market, they could invest in real estate outside of the city instead. Pam Liebman, the chief executive officer of the Corcoran Group real estate brokerage firm, says that she has seen some softening of the high-end housing market. Before September 11, Liebman says, the real estate market already exhibited a slow downward trend. Since the terrorist attacks, that downward slope has accelerated. Still, she says that she hasn't seen evidence yet of a mass exodus to the suburbs. And Liebman argues that there will always be people looking to live in Manhattan. "Rents had gotten so high in Manhattan," Liebman notes. "Downward pricing pressure could actually bring some people back." The impact on New Yorkers of low and moderate income, on the other hand, may well be dramatic, in a city where one quarter of renter households already spend more than half of their monthly income on housing. Margaret Hughes, executive director of the Good Old Lower East Side, a community-based organization in lower Manhattan, reports that she has already begun to see the impact in her neighborhood. She personally knows some three dozen people who have lost their jobs in the World Trade Center and Financial District. These displaced low-wage workers, many of whom were already struggling with excessive rent burdens, are now seeking jobs in a market in which competition has intensified since September 11. The Fiscal Policy Institute estimates that 79,700 New York City workers will be laid off by the end of the year as a direct result of the September 11 attack. Sixty percent of those predicted layoffs are in service sector jobs with an average wage of only $11 an hour, or a full-time salary of $22,880. "The housing situation was already so bad on the Lower East Side because of displacement. Now the pressures will be even harder," Hughes says. There was "a slight break in actual eviction cases, because of agency and court shutdowns" after the disaster, she notes. (See story on evictions by Rebecca Webber) But Hughes said that should change soon, as the city government recovers. In the coming year, a deepening recession may also start to take its toll on homelessness, says Patrick Markee of the Coalition for the Homeless. In addition to the shrinking economy, some 30,000 low-income New Yorkers are at risk of losing their welfare benefits at the end of 2001, as the five-year time limits enacted in 1996 begin to kick in. As the mayoral candidates slugged their way to the finish line, Michael Bloomberg was actually making the loudest argument for immediate new housing, which surprised some observers. But from the beginning, Bloomberg saw affordable housing as essential for the city's continued economic success. In his campaign's Housing Blueprint, released in June, Bloomberg had declared: "As New York has become the safest large city in the nation, it's become a magnet for commerce. We must assure an adequate supply of housing as part of this city's quality of life for all income levels or this progress will be reversed and everyone will suffer." 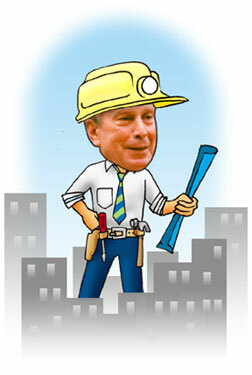 After the disaster Bloomberg began to feature affordable housing as part of his plan to prevent employers from moving outside of the city. In a post-September 11 interview with the New York Times, he said that one could "make the case that we need housing more than we need office space" to keep the city attractive to corporations that might otherwise be tempted to leave. To retain employers and to woo the best workforce in uncertain times means improving the quality of city life through more affordable housing, better schools and accessible healthcare. Bloomberg has praised the city's housing production under Mayor Ed Koch. He has said that the city needs at least 100,000 new units of housing. With the other candidates, he also pledged (before September 11) that he would re-commit revenues from Battery Park City to supporting affordable housing, a promise that had been made decades ago, when Battery Park City was first developed. Bloomberg also has declared his commitment to improving housing inspections, changing the way the Department of Housing Preservation and Development operates, from simply responding to complaints to performing regular inspections and actively enforcing the code. "People shouldn't have to live with rats, mold, leaky pipes or without heat," he said. Indeed, he suggested in one of his campaign's early housing papers that those landlords who persisted in serious housing code violations could have their buildings taken away from them, and given to new owners through the popular Third Party Transfer program. Currently, landlords can only be foreclosed upon if they are also in significant tax arrears. This position went far beyond his Democratic opponents. And Bloomberg has implied that the city's resources should be steered toward low- and moderate-income New Yorkers, telling Time Out New York that "neither the monies to subsidize housing for people making $75,000 a year nor the political will to do so exist." Still, he has not made it clear how he defines "affordable housing" -- unlike the Democratic candidates, he has never specified which income groups would benefit from the 100,000 new apartments he envisions. Some advocates insist that direct government investments and rental assistance will be needed to make the housing market affordable for low-income New Yorkers. Bloomberg has suggested his philosophical distaste for such subsidies in the past. Thus far, the details of Bloomberg's housing production plans have focused instead on encouraging private developers to make housing "affordable" by lowering the cost of construction through the city's zoning and land-use authority, not through direct investment in low-income housing. At the national level, the National Low Income Housing Coalition has asked Congress to dedicate $5 billion in economic stimulus funds to create the HOME program nationwide, which it says would provide 75,000 apartments for extremely low-income families and 184,300 new jobs. Locally, advocates suggest that immediate assistance for housing needs must also come from Federal aid packages, given the lack of available city resources. One proposal would establish an emergency allocation of Section 8 housing vouchers, to make sure that New Yorkers who lost jobs and income do not lose their homes as a consequence. Increased rental assistance and other measures would be a cost-effective way to prevent the shelter population from growing. "We've seen that homelessness has a definite cost that can't be avoided," says Markee of the Coalition for the Homeless. "New York City will be forced to spend money if we do nothing," he says, citing the high costs of temporary shelter that the city is required to provide the homeless by law. Michael Schill, the NYU housing expert, favors an increased emphasis on regulatory reforms and other cost saving measures to mitigate the potential new costs of construction. In July 1999, the Center for Real Estate and Urban Policy released a study proposing a series of regulatory and policy reforms to reduce the cost of housing construction in New York City. Schill says that these policy recommendations have not changed, but that they will now be shaped - and made more necessary - by a worsening economy. "Advocates for social justice need to express our hope that the economic stimulus package for New York City will help with affordable housing for the entire city," Lander says. "Those of us who are heartbroken by this tragedy but who are also committed to greater social equity need to find ways to rebuild that address the employment and housing needs of the entire city, including low-income and working- class New Yorkers in all five boroughs." The future of housing in New York will be shaped by an economic catastrophe and rebuilding effort that nobody ever expected. But while the impact of September 11 can't be underestimated, neither did it wipe the slate clean. New Yorkers face new problems that we never dreamed of, but the old problems remain as well. Mark Ladov, a former advocate with Housing First!, is currently working with the Corporation for Supportive Housing. Visit the Issue of the Week archives. Tell us what you think about this issue. Write a letter to the editor.